Is your PPC Software working as hard as it could be? WordStream’s PPC Software automates the most tedious and laborious tasks associated with pay per click marketing, while still leaving you in total control. Transform your paid search advertising campaign into a powerhouse of strategic automation! WordStream's software for PPC puts you miles ahead of the competition, by combining keyword research, workflow management, ad creation and campaign analysis in one easy-to-use interface. Manually carrying out all of the various tasks associated with effective pay-per-click search advertising is impractical. Researching, sorting and implementing PPC keyword data is an arduous task. If done by hand, the work will overwhelm even paid search experts. What's worse, hundreds, thousands, or even millions of valuable long-tail keywords and other crucial insights go completely unnoticed. On the other hand, hiring an SEM agency to do all this work for you is too expensive for many SMBs. And create AdWords text ads for them, all with just a few clicks. We've shown you how important strategic automation is to your pay-per-click marketing software solutions, but can too much automation be a bad thing? If you're enabling the wrong type of PPC marketing automation, you might be allowing your pay-per-click tool to do more harm than good. While tedious, labor-intensive pay per click campaign tasks are perfect for automation, certain strategic and analytical tasks are still best left for a person to assess. WordStream's pay per click advertising software offers you suggestions for things like negative keywords, keyword grouping, and new keywords based on decisions you make about your keyword list, but it will only act on the aspects of your campaign that you've designed, in the ways in which you have outlined. A good PPC tool works for you, not instead of you. WordStream's automation software takes care of the tedious aspects of PPC keyword management while making intelligent keyword recommendations, but ultimately leaves the decisions up to you. Traditional PPC approaches involve manually researching a list of keywords that may or may not be truly applicable to an effective AdWords campaign. You'd then narrow the list down to a couple hundred terms, create text ads, and monitor the results by dumping the data into spreadsheets and combing through it on a regular basis. WordStream PPC software makes AdWords campaign management much easier. Let's look at an example of WordStream's keyword grouping and organization capabilities in action. WordStream PPC software offers keyword research tools and Web analytics tools that will help you to gather keyword insights. The keyword PPC software also offers automated keyword suggestion, allowing you to review and then quickly implement keyword suggestions. It's this implementation that makes WordStream particularly powerful. The tool allows you to effectively manipulate your keywords into groups that you can act in your AdWords account. With our Campaign Builder, you can start from zero and quickly create an effective campaign, by simply selecting a topic, choosing from the suggested keyword groups, and then choosing your campaign settings. Imagine how much time and effort this would take manually; we would have to pull in all of our keyword data (research we'd have to do weekly) and hack around in Excel to try to determine which groups we should create, finally actually putting the segmentations together and porting them over to AdWords. Instead, WordStream PPC research software lets us set up an account by clicking a few buttons, and since it integrates seamlessly with AdWords, your work is all under one roof. WordStream PPC campaign software offers similar suggestions for keywords you don't want. WordStream's negative keyword tool offers you suggestions for keywords that you might want to actively avoid bidding on, based on what the PPC marketing software knows about your account. WordStream identifies these keywords that are probably a bad fit for your account, and by setting them as negative (again, with the click of a button), you can put a stop to that wasteful spending your PPC account. Success with pay-per-click automation means automating the right aspects of your PPC campaign, at the right time, and with the right tools. WordStream's PPC advertising automation software provides everything you need to completely transform your paid search campaign into a powerhouse of strategic automation and personal decision making. You can also inquire about our AdWords Consulting Services and receive guidance from our Google Certified AdWords Consultants. Our clients are typically small businesses, medium sized companies and pay-per-click agencies. Let WordStream for PPC software help optimize your campaigns to their full potential. Why Do We Offer a Trial of our PPC Software Free? With WordStream's free trial, you can get seven days of free PPC software. We offer this test period of free PPC analysis software because we are confident that once you try our free strategic marketing software, you'll realize the core benefits of WordStream for PPC, recognize it as the best PPC software on the market, and sign-up. Our PPC automation software makes pay-per-click marketing fast and easy for small businesses who are too busy to devout large amounts of time to PPC. WordStream also offers PPC management software for agencies looking to manage and optimize their clients' accounts while staying organized. In addition to testing out the free PPC campaign management software, WordStream provides additional free PPC marketing services such as our free PPC tools to help improve your AdWords campaigns. Try the best PPC management software today - sign up for a free trial of our Google PPC software! Interested in SEO? Our software can be used to optimize SEO campaigns as well as Google PPC campaigns! Still confused and wondering what is PPC? Try browsing through our collection of free AdWords EBooks! This sophisticated free PPC tool allows you to compare your Performance Grader score with competitors in similar spend brackets, giving you a sense as to where you fit into the competitive landscape, no PPC audit software needed! The AdWords Performance Grader has been designed by PPC experts to show you where your campaign is struggling and how to make adjustments that will improve your performance and increase your ROI. 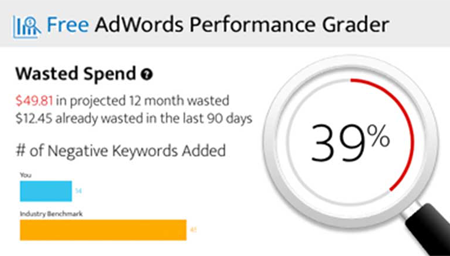 Try the AdWords Performance grader to get your free PPC campaign analysis, and start improving your AdWords account immediately.